Fanny Price is no Elizabeth Bennett. But really, why should she be? There is no reason for Jane Austen to have written the same character and the same story over and over. However, it seems that many people fall in love with Pride and Prejudice and then expect Austen's other works to be the same. They want all her novels to be "light and bright and sparkling" as Austen described Pride and Prejudice. Mansfield Park is a darker, less sparkling book but it stands squarely on its own merit. It is a novel with a quiet, meek, yet morally strong heroine and it contains a biting commentary on the society of the day. 'But I shall think her a very obstinate, ungrateful girl, if she does not do what her aunt and cousins wish her--very ungrateful indeed, considering who and what she is. This comment by Mrs. Norris was not widely approved of but it did crudely express the position Fanny was in, a position common to many poor relations who felt an obligation to their richer relatives who took them in. Poor relations have so much to lose, they cannot be a rebel because a rebel can end up out in the cold. Fanny's values are clear cut and she expects the rest of society to feel the same way she does. She is obedient, respectful to those in authority even when they do not seem to deserve that respect, and she has an elevated moral sense. It is through Fanny and her moral sense that Austen comments on the society of her day. Fanny is disturbed when her cousin flirts with one man while engaged to another and she is disgusted by the man who knowingly flirts with that cousin. She disapproves of the play that is being put on because it is a vehicle for that flirtation and because the play itself is questionable. Fanny disapproves of the way Mary Crawford speaks of the clergy and she also dislikes the lack of respect Mary shows toward her own uncle. She believes in upholding the standards of the day and is truly disturbed as she watches the slow disintegration of those standards in those around her. Meek and mild Fanny has the courage to stand up to opposition when she feels it is necessary. She refuses to act in the play even though pressured to do so. She refuses to accept an offer of marriage even though she is called willful and perverse and ungrateful, hard words for a girl who has built her life around being grateful for what she has been given, little though it may be. Some find Fanny judgmental, but is it judgmental to have high standards and stick to them when those around you are not doing so? Fanny was not perfect and she knew that. However, she had the courage of her convictions. Isn't that admirable? Fanny is not the most appealing character in the book in many ways. She is quiet and meek and Mary Crawford is her antithesis. Mary is light and bright and sparkling but she is also worldly and disrespectful. She is full of fun and essentially kind, yet self-centered and hardened to the things that offend Fanny. It is interesting to see how the coming of Mary and her brother, Henry, into the community infect the inhabitants with a different attitude. Those around Fanny are the ones who throw off the traces and it is through her eyes that we see what is happening. For really, this is not the story of Fanny Price specifically. As the title suggests it is the story of Mansfield Park as a whole. her happiness was of a quiet, deep, heart-swelling sort; and though never a great talker, she was always more inclined to silence when feeling most strongly. Mansfield Park is undoubtedly the most controversial and the most sophisticated of Austen's novels. It is definitely one that bears repeated reading. It is not as bright and sparkling as Emma or Pride and Prejudice. It may not appeal to the teenager in us as Sense and Sensibility does. It is not just plain fun as Northanger Abbey is. It is not as romantic as Persuasion. It does not have to be any of these things. Fanny Price should be valued for her quiet strengths and so should the novel that contains her. This was reviewed as part of my Classics Club list. Good and honest review.It is rather unfair that Mansfield Park gets a very raw deal with constant comparisons to other works of Austen. Before I read the book, I came across reviews that described Fanny as everything from "boring" to "insipid".After all, how many Elizabeth Bennets and Emma Woodhouses can we have? I thoroughly enjoyed the book and reading your review put the book back in my mind. All the best! Thank you for your comment. I agree that the general reaction to Mansfield Park is unfair. It is a different book but that does not make it an inferior book. And as a shy, quiet person myself I have a bit of a soft spot for Fanny. I completely agree with you. 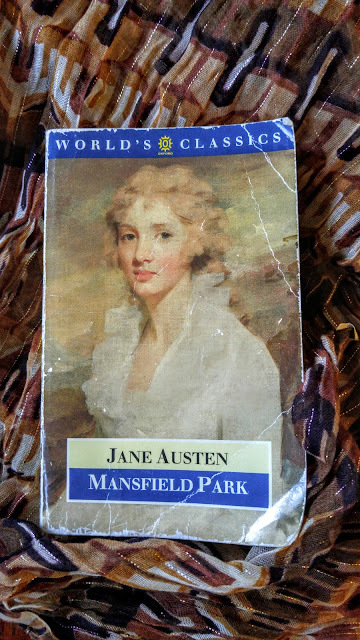 I've read all of Austen's major novels, and I consider Mansfield Park masterful. Really, I consider them all masterful. My favorite is Sense and Sensibility. Which is more about the literary feminist in me, than the teenager. Anyway, this one is incredible, I think. I love the theme of acting and Fanny's I CANNOT ACT. As in, act her role, as in fall in line, as in all of you are acting and I'm the only real person here, and I will not be moved. That's strength. Exactly, it takes real strength for her not to act, to be herself when all around her are pressuring her to do otherwise. Quiet strength is frequently undervalued. Mansfield Park is masterful. It has a lot going on under the surface. Well, you've certainly sold Mansfield Park to me! I love quiet, shy heroines -- she doesn't sound passive at all! She sounds like a perfectly flawed human being. And yes, I can see how the stock image of a modern "strong woman" can affect comtemporary views of Fanny. But sometimes I don't understand the expectation to rebel and mouth off all the time. Wouldn't it have gotten someone like Fanny kicked out of the house? Mansfield Park is definitely on my to-read list. Thanks for a beautiful review! I think sometimes people have trouble setting aside their contemporary views and accepting a book and its characters as products of their time period. Strength is not only shown by rebellion. And yes, Fanny could not just arrogantly push her views forward. She could have gotten sent back home which would have been a hardship for her whole family. Mansfield Park is a book that brings up a lot of issues and opinions. I will be very interested to see what you think after you read it. I really hope you like it! I read this about 14 years ago and didn't appreciate it then, but having re-read it last year, I had a change of heart. I think what you said about modern sensibilities and the tendency to admire outspoken & feisty heroines is so true and can veil the real beauty of a character like Fanny Price. Great review! Thank you. I read all of Austen when I was quite young and Mansfield Park was my least favorite. I still loved it because I loved all of Austen but it was the one I reread least frequently. In recent years I have read it several times and come to appreciate more and more the book itself and the character of Fanny Price. Modern sensibilities can so easily detrimentally affect our appreciation of older works of literature.